Funny thing about red lines, as our former President can attest: if you draw them, you’d better be ready to enforce them. Unless they’re just for show–sham lines, a little-known offshoot of “fake news” that seems to be the latest weapon in CNN’s arsenal against POTUS. In the immediate aftermath of the 2016 election, Jones—a political activist, attorney and CNN commentator—made a viral splash for his nuanced reflections on Donald Trump’s rise and surprising victory. The powers-that-be are so enamored with him that, even though he is nominally just an opinionizer, Van’s been given his own series of news specials to anchor, with the next airing on Wednesday. But does he have the qualifications for the push Zucker is giving him? Let’s go down the list. Communist? Check. Supporter of cop-killer Mumia Abu-Jamal? Check. 9/11 truther? Check. And check. Plus, he stayed at a Holiday Inn, more than once. Your Cable Gamer reminds you of all this detail to underscore the sensitivity of such an extreme curriculum vitae for one who is to anchor programs about a hotly contested election. Because CNN clearly does not want its employees going out there and taking part in activist doings. Otherwise why would they have told them so just four days ago? At the CNN editorial meeting Wednesday morning, Rick Davis, who heads up CNN Standards & Practices, reminded employees that they are not allowed to participate in the events. CNN tells TVNewser it has a longstanding policy that employees may not participate in political marches or rallies. “Rick was simply re-iterating the policy in advance of the marches this weekend,” a spokesperson says. That would seem pretty clear on its face, but at CNN rules are like pie crust–made to be broken. Especially if you are a “breakout” star. So who should show up at the women’s march, not just observing or reporting, but as a featured speaker? You guessed it: Van the Man. He don’t need no stinkin’ rules. This clearly didn’t take CNN by surprise; his role was publicized well in advance. Yet there he was, on CNN’s air, doing his opinionizer job–trashing Trump’s speech–just hours before he’d be out there giving one of his own. The Cable Gamer thinks all this has a certain aroma about it, and it’s not a fragrance any respectable news organization would want to wallow in. Mind you, it’s not like CNN couldn’t see it coming. They do read The Hill’s savvy Joe Concha, don’t they? A contributor job where one is paid to opine on television may not be able to compete with what said contributor deems as a bigger, more important cause. In Jones’s case, that’s a massive “love army” aided by his own boutique PR firm…CNN’s audience either needs to be informed of this potential conflict of interest or Jones needs to be shown the bench when it comes to any Trump segment. The Cable Gamer wondered if those media monitors at Reliable Sources would deal with this situation today. After all, their “breakout” star flagrantly violating the rules set down by his employer, and then being rewarded with tons of free, favorable PR…that doesn’t happen every day in the world of cable news. But neither Brian Stelter nor anyone on his cumbersome, Brobdignagian panel even uttered the name of “Van Jones.” Because the first rule of Reliable Sources is followed more strictly than anything Rick Davis may propound: CNN doesn’t talk about its Cable Game. Now get that countdown clock up for the next Van Jones special. How can we trust the news? When they espouse their ideology! They are not reporting they are showing their bias! 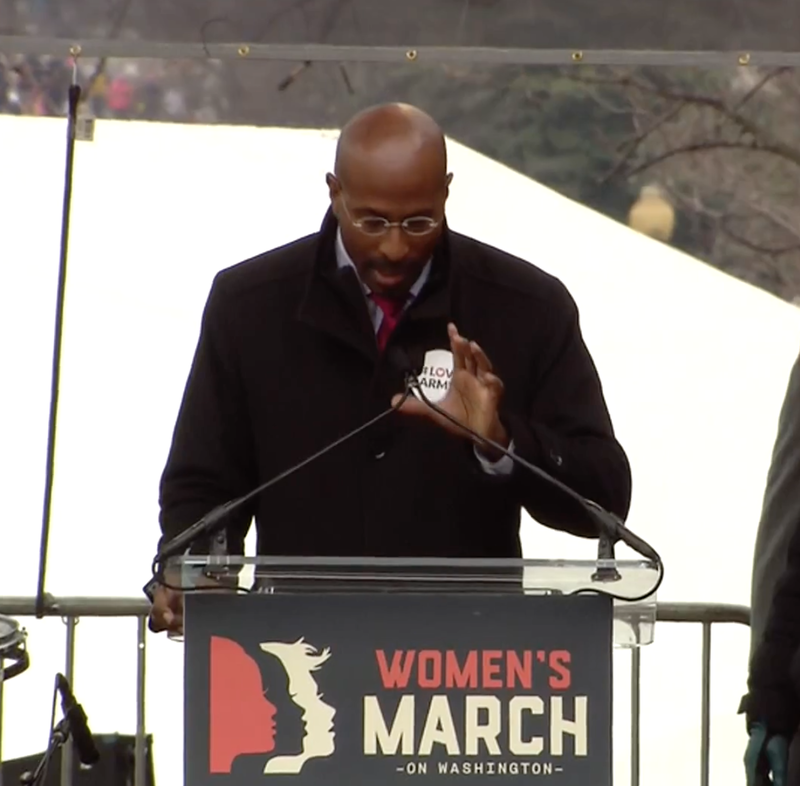 Should it matter if Van Jones is a ‘contributor’ and not an ’employee’ when it comes to CNN’s rule about not participating in the women’s march?